Verizon's DNS leverages our massive global Internet Protocol (IP) Anycast network, with high-performance proximity to almost every broadband user in the world. 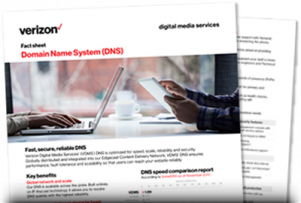 Verizon has the high-availability DNS service you need for secure, scalable delivery. By hosting your DNS with us, you can protect yourself against large-scale DDoS (distributed denial-of-service) attacks and other threats like cache poisoning.